First, the direct: the Qandahar operation that General McChrystal began trumpeting in late February is clearly going wobbly before it begins. The promise to demonstrate progress (i.e., to see light at the end of the tunnel) in Afghanistan by this summer is being bow-waved at least into the Fall, during the height of mid-term election season. The scope of the looming operation is also being scaled back, and its goals are being redefined in more ambiguous terms. The Qandahar offensive always strained credulity: According to Landay’s sources in the Pentagon, the original concept assumed 20,000 troops could pacify the urban/rural region with 800,000 inhabitants. This level of effort always appeared grossly insufficient, especially when compared to recent Marjah offensive, which used 10,000 troops for an operation aimed at pacifying a rural region with one-tenth as many inhabitants. And the success of the Marjah operation to date has been problematic, to put it charitably. McChrystal can not rely on the Afghan forces to protect the Marjah “ink spot,” so he still needs the presence of Marines to pacify the region, which means less troops for spreading that ink spot of security to Qandahar. Moreover, a key component of McChrystal’s strategy -- the so-called ‘government in a box’ that McChrystal bragged he would put into place in Marjah -- has turned out to be a sham that has proven unable to protect the people. Given (1) that Qandahar is second largest city and the only major city in Afghanistan with an overwhelming Pashtun majority, (2) the fact that Qandahar is the spiritual home of the Taliban, and (3) the fact that the local ruler is the unmanageable, obscenely corrupt half brother of Hamid Karzai, the Afghan president, the task of permanently cleansing Qandahar of the Taliban on a permanent basis will be far more difficult than failed effort to clean out Marjah. Even if one were to assume that our counter insurgency strategy is a blueprint for success, achieving this object with confidence would require far more troops. But those troops are not available, and the probability of General McChrystal successfully squeezing the President again for another “surge” of reinforcing troops is close to nil. More important in my opinion, however, is the information that can be teased out of the McClatchy report. This is embodied in the mindset revealed by the words General McChrystal used to explain his strategy: "It's important that we engage the population so that we shape the leaders, the natural leaders, the elders, political and economic leaders so that their participation helps shape how we go forward," [emphasis added]. This statement reveals why our current strategy is a roadmap to folly. Landay et al did not say much about this comment, except to say that our forces have “made little headway in building a foundation for a respected local government capable of winning the confidence of the nearly 1 million Afghans who live in and around Kandahar,” a point expanded on in greater detail by Patrick Cockburn in an excellent report in the 16 May edition of the Independent. McChrystal’s verbiage is not casual milspeak -- the idea of “shaping” is deeply rooted in the US military mindset and derives from the doctrinal concept of shaping a battlefield prior to doing battle. In this case, however, the ‘shaping’ has been mutated into a cultural imperative, which is a far more subtle thing. The statement assumes we can “shape” the outlook and behaviour governing the minds of the natural leaders of the Pashtuns, or more precisely, that we can manipulate the all important Orientation function in the Observation - Orientation - Decision - Action or OODA loops of the traditional leaders. Just who are these leaders? For starters, they are the leaders of the most xenophobic, historically-minded, proud tribal cultures in the world. McChrystal’s theory of shaping the OODA loops of these “natural” leaders reveals a contemptuous sense of superiority that is not just arrogant but also appallingly ignorant of the culture it assumes it can manipulate. In the Pashtun culture, leaders at all levels (sub clan, clan, tribe, and tribal group) are not picked by primogenitor or god, they emerge out of an arduous process of consensus building among the members of the group. Leaders rise naturally, by consent, like cream in milk, based on demonstrated wisdom, bravery, and especially, the strength of their personal character, which is always ascertained in accordance with the Pashtun moral code, known as Pashtunwali. They have reached their position by demonstrating their worthiness to lead by adhering to and exemplifying the values of this code, which just happens to be one of the strictest and most demanding tribal codes of personal honor ever to have evolved. They are not easily manipulated, especially by outsiders. When Pashtuns are left to themselves, the code of Pashtunwali is strong enough to limit the internecine quarrelsome behaviour of the members of the largest tribal vendetta culture remaining in the world. Being a vendetta culture means that Pashtuns have long memories, that affronts to honor are of paramount importance and must be avenged. Pashtuns also have a tradition of hospitality and sanctuary. Yet, they are united by hatred of foreign invaders and they often put aside internecine fighting and vendettas to expel invaders. And they are extraordinarily proud of their ability to expel invaders, which they have done with considerable success over the last 2,300 years. Pashtuns may have a wild and woolly culture from our perspective, but it would be a mistake to think of it as primitive or lacking a coherent moral center; it is highly evolved value system, well-tuned to the harsh conditions of the natural Afghan environment. It is also a culture that is very alien to the western European and American traditions, and therefore difficult for outsiders to comprehend. That the leaders in the United States military believe they can construct a successful strategy based on the premise that outsiders like themselves will be able to manipulate Pashtun leaders like puppets descends into transparent absurdity, when one juxaposes McChrystal’s ambition to the fact, well known among Pashtuns if not Americans, that the United States has contributed directly or indirectly to the murderous horror that has been Afghanistan since 1979. Now, ten years and a lot of stirring later, the details of the script may have changed, but the arrogance of the ignorance shaping the outlook of our leaders has not. That is why we now have an Army General concocting a “shaping” strategy based on the assumption that the American military can manipulate the behavior of millions of stirred up Afghans like puppets. For readers unfamiliar with the theory of the OODA LOOP and its inventor, the American strategist Colonel John Boyd: A brief introduction can be found in my essay Genghis John. More comprehensive but accessible descriptions can be found in the books by Robert Coram and James Fallows, and Chet Richards, among many others. For those readers who are interested in heavy intellectually lifting, see Franz Ozinga's analysis of Boyd's strategic thought or even better, they could study Boyd's original presentations, which can be downloaded from the folder labeled “Boyd Briefs” in my Public Folder. Does the US (or UK & Japan) Face a Sovereign Debt Crisis Like Greece? In the attached report in NewDeal 2.0.org, my good friend Marshall Auerback analyzes the currency/debt crisis in in EU, and explains why this creates a situation fundamentally different from that facing nations with sovereign currencies, like Britain, Japan, and the United States. It is a distinction that needs to be kept in mind, if the US is have a constructive fiscal policy. Marshall also concludes that the crisis in the Euro will not be fixed by the recently approved bailout to Greece, because there is a fundamental flaw at the heart of the EU design. His analysis leads to the following conclusion: By establishing a common currency, the individual countries have sacrificed independent monetary policy to a supranational monetary authority. This obviously sacrificed monetary autonomy, but it also paralyzed each country's ability to run counter-cyclical fiscal policies. The only way out of the trap would be (1) to set up a supranational fiscal agency (in effect, with each member giving up de jure fiscal autonomy and placing each country's counter cyclical policy powers under the supreme power of a supranational fiscal agency -- in effect reducing each nation's economic sovereignty to a level similar to that held by a state in the United States, or (2) or by getting out of the euro and going back to some arrangement like that of the EU prior to the adoption of the Euro -- an arrangement which, readers should remember, led to enormous progress. Auerback does not examine the political implications of Option 1 (hopefully he devote his prodigious analytical talents to this question in future), but it seems to me that, given the history of nationalism and cultural differences in Europe, Option 1 might lead to political situation somewhat similar to, if not as extreme as, that of Yugoslavia before it disintegrated in the 1980s. The relatively rich republics of Yugoslavia (Slovenia and Croatia) resented policies that transferred of wealth to the relatively poorer republics, like Serbia, Macedonia, Montenegro, or the autonomous region of Kosovo. Once Tito's organizing genius disappeared, the linkages stitching the country together became frayed and eventually snapped as old grievances manifested themselves in newer forms. The same type of evolution could happen to the Europe Union if it underwent a supranational fiscal union, where the rich countries feel they are being unfairly burdened -- the beginnings of which are already in evidence. The great achievement of the EU has been to reduce the probability of violent nationalist conflict among some of its members to a vanishingly small probability while improving the economic lot of its members. Most of this reduction in the propensity toward violence and economic growth took place before the adoption of the Euro. It may be that giving up the Euro is the wiser alternative in the long run, unless someone can synthesize some kind of third option. It’s time to understand that there is a fundamental difference between Greece and the US. The latest to pronounce on this matter is the Governor of the Bank of England, Mervyn King. This is a particularly sad, as the BOE - the Old Lady of Threadneedle Street - has actually played a uniquely constructive role among central banks in the area of financial services reform proposals. King, and his associate, Andrew Haldane, Executive Director for Financial Stability at the Bank of England, have been outspoken critics of “too big to fail” banks, and the asymmetric nature of banker compensation (”heads I win, tails the taxpayer loses”). This stands in marked contrast to America’s feckless triumvirate of Tim Geithner, Lawrence Summers, and Ben Bernanke, none of whom appears to have encountered a banker’s bonus that they didn’t like. 1. There is a fundamental difference between debt held by the government and debt held in the non-government sector. All debt is not created equal. Private debt has to be serviced using the currency that the state issues. 2. Likewise, deficit critics, such as King, obfuscate reality when they fail to highlight the differences between the monetary arrangements of sovereign and non-sovereign nations, the latter facing a constraint comparable to private debt. 3. Related to point 2, there is a fundamental difference between a sovereign government’s public debt held in its own currency and public debt held in a foreign currency. A government can never go insolvent in its own currency. If it is insolvent because it holds foreign debt, then it should default and renegotiate the debt in its own currency. In those cases, the debtor has the power, not the creditor. This is undoubtedly correct. To eliminate this structural problem, the countries of the EMU must either leave the euro zone or establish a supranational fiscal entity that can fulfill the role of a sovereign government and deficit spend to fill a declining private sector output gap. Otherwise, the euro zone nations remain trapped — forced to forgo spending to repay debt and service their interest payments via a market-based system of finance. But King then inexplicably extrapolates the problems of the euro zone, which stem from this design flaw unique to the euro, and exploits it to support a neo-liberal philosophy fundamentally antithetical to fiscal freedom and full employment. The Bank of England Governor and others of his ilk are misguided and disingenuous when they seek to draw broader conclusions from this uniquely euro zone-related crisis. Think about Japan — they have had decades of deflationary environments with rising public debt obligations and relatively large deficits to GDP. Have they defaulted? Have they even once struggled to pay the interest and settlement on maturity? Of course not, even when they experienced debt downgrades from the major ratings agencies throughout the 1990s. Retaining the current bifurcated monetary/fiscal structure of the euro zone leaves individual countries within the EMU in the death throes of debt deflation, barring a relaxation of the self-imposed fiscal constraints or a substantial fall in the value of the euro (which will facilitate growth via the export sector, at the cost of significantly damaging America’s own export sector). This week’s €750bn rescue package will buy time, but will not address the insolvency at the core of the problem. And it may well exacerbate it, given that the funding is predicated on the maintenance of a harsh austerity regime. José Luis Rodríguez Zapatero, Spain’s Socialist prime minister, angered his trade union allies but cheered financial markets on Wednesday when he announced a surprise 5 percent cut in civil service pay to accelerate cuts to the budget deficit. The austerity drive — echoing moves by Ireland and Greece — followed intense pressure from Spain’s European neighbors and the International Monetary Fund on the spurious grounds that such cuts would establish “credibility” with the markets. Well, that wasn’t exactly a winning formula for success when it was tried in East Asia during the 1997/98 financial crisis, and it is unlikely to one this time. Indeed, in the current context, the European authorities are simply trying to localize the income deflation in the “PIIGS” through strong, orchestrated IMF-style fiscal austerity, while seeking to prevent a strong downward spiral of the euro. But the contradiction in this policy is that a deflation in the “PIIGS” will simply spread to the other members of the euro zone with an effect essentially analogous to that of a competitive devaluation internationally. The European Union is the largest economic bloc in the world right now. This is why it is so critical that Europeans get out of the EMU straightjacket and allow government deficit spending to do its job. Anything else will entail a deflationary trap, no matter how the euro zone’s policy makers initially try to localize the deflation. And the deflation is almost certain to spread outward if sovereign states such as the US or UK absorb the wrong lessons from Greece, as Mr. King and his fellow deficit-phobes in the US are aggressively advocating. There are two direct contagion effects from the fiscal retrenchment being imposed on the periphery countries of the euro zone: first, on the banking systems of the periphery and core nations, as private loan defaults spread on domestic private income deflation induced by the fiscal retrenchment; second, to the core nations that export to the PIIGS and run export-led growth strategies. So 30-40% of Germany’s exports go to Greece, Italy, Ireland, Portugal and Spain directly, while another 30% to the rest of Europe. These are far from trivial feedback loops. And the third contagion effect is to the rest of world growth as domestic private income deflation, combined with a maxi euro devaluation, means exporters to the euro zone and competitors with euro zone firms in global tradable product markets are going to see top line revenue growth dry up before year end. Let’s repeat this for the 100th time: the US government, the Japanese Government, and the UK government, among others, do NOT face a Greek style constraint — they can just credit bank accounts for interest and repayment in the same fashion as they would buy some helmets for the military or some pencils for a government school. True, individual American states do face a fiscal crisis (much like the EMU nations) as users of the dollar. That is why some 48 out of 50 now face fiscal crises (a problem that could easily be alleviated were the US Federal Government to undertake a comprehensive system of revenue sharing on a per capita basis with the various individual states). But, if any “lesson” is to be learned from Greece, Ireland, or any other euro zone nation, it is not the one that Mr. King is seeking to impart. Rather, the lesson is the futility of imposing arbitrary limits on fiscal policy devoid of economic context. Unfortunately, few are recognizing the latter point. The prevailing “lesson” being drawn from the Greek experience, therefore, will almost certainly lead the US and the UK to the same miserable economic outcome, along with higher deficits in the process. As they say in Europe, “Finanzkapital uber alles”. Roosevelt Institute Senior Fellow Marshall Auerback is a market analyst and commentator. On January 2, during an interview with Drew Brown of Stars and Stripes, McChrystal described his plan to create an ‘arc of security’ in the most densely populated regions of Southern Afghanistan. The green shaded area in the following map of Afghanistan overlays McChystal’s arc on the distribution of population densities. I constructed it from the information contained in Brown’s interview. 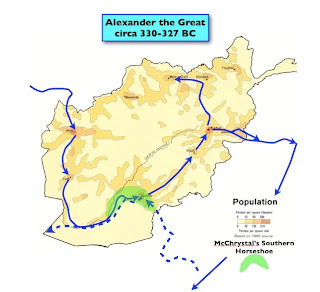 As you can see, McChrystal plan opens his biggest military campaign to date by invading a region that has seen many invasions and much fighting during the last two thousand years, including operations by Alexander the Great (also shown on the chart), both of the 19th Century Anglo-Afghan Wars, and the Soviet-Afghan War of the 1980s. Historically minded tribal cultures, like the Pashtun, have had plenty of time to learn and remember the strengths and weaknesses of this terrain by resisting these invaders using the timeless arts of guerrilla war. Note, for example, the stunning similarity of Alexander the Great’s invasion route in the figure to that of the Soviet’s shown here. McChrystal’s first move in implementing his pacification strategy was to invade Marjah (which is in the western part of the shaded area) in mid February. The aim of this operation was a variation of Marshall Lyautey’s ink spot theory: namely to clear the Taliban out of Marjah, secure the area, and prevent the return of the Taliban. Success in this operation would set the stage spreading the area of pacification by clearing the Taliban out of the more populated city of Qandahar. 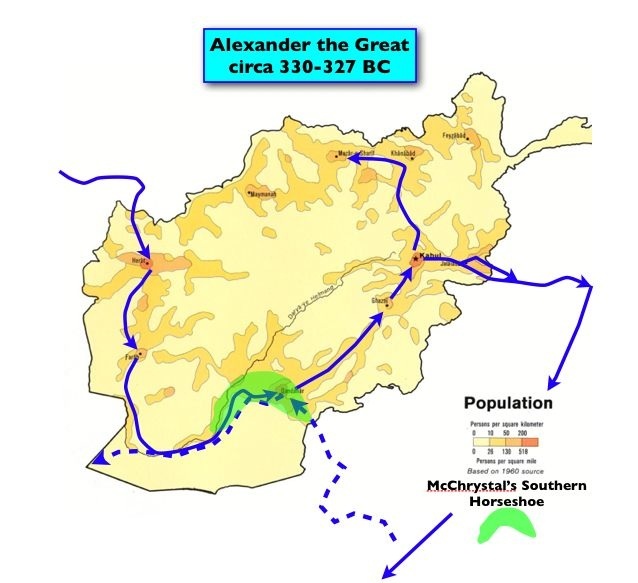 And so, moving from west to east along Alexander’s (and the Soviet’s) route, the ink spot would spread to Qandahar in the eastern part of the arc. Without being critical, I note that neither Porter nor his sources mention the role of Afghan army and police forces in the unravelling of McChrystal’s plan. Porter is certainly aware of these limitations, having written several important reports on this subject. Nevertheless, the implication of the Taliban re-infiltration of the Marjah region is clear: the Afghan security forces in the region are either insufficient or ineffective (or both) to perform their job of protecting the people by permanently cleansing the area of Taliban. The inability to spread the “ink spot” McChrystal tried to insert with the Marjah offensive has its roots in the central flaw highlighted last September in my critique of McChrystal’s escalation plan, which was submitted to President Obama last summer. This inability also means that US forces will be needed to provide security to the Marjah region, if McChrystal sticks to his strategic aim. This requirement, which would have been easily foreseen, had McChrystal presented Mr. Obama with a straightforward assessment of the very limited capabilities of the Afghan security forces, will now result in our forces being spread out to protect this region, assuming we want to protect the Marjah “ink spot.” The deployment of US pacification troops will probably take the form of an array of strong points and outposts, backed up with quick reaction reinforcements, kept on alert in nearby bases, together with airpower. If our troops are being deployed this way, they will be unavailable for the upcoming Qandahar offensive. Moreover, they will become vulnerable to being attacked piecemeal in a series of irregular, but frequent hit and run attacks on bases and supply routes. This kind of rope-a-dope strategy will keep our troops on edge and put them under continual mental and physical stress -- and they will be vulnerable to being ground down much like the British troops were last summer. The continuing pressure will naturally increase the jumpiness of our soldiers and marines and, if past is prologue, will likely increase their trigger-happiness, including more calls for artillery and air support. More firepower means more civilian deaths in the “pacified” region, and the rising bloodshed will play into the Taliban’s hands by alienating the hearts and minds of local population we claim to be protecting, a process which is already in progress. This hydra of emerging pressures, which is probably just beginning to be appreciated, is probably why the looming offensive to secure Qandahar that McChrystal was broadcasting in April is now being scaled back in its aims. Later this summer, as these problems become more apparent and American mid-term elections loom, we can expect to be subjected to a unseemly spectacle finger pointing and a search for scapegoats. In the end, the debacle will be fault of Obama and by extension the Democrat’s, because the President ignored Sun Tzu’s timeless wisdom, when he approved McChrystal’s fatally flawed plan, despite the cabled warnings of retired Army general Karl Eikenberry, his ambassador to Afghanistan. I've seen this movie before. In 1989, I was a fraud investigator hired to dig into the cause of the Exxon Valdez disaster. Despite Exxon's name on that boat, I found the party most to blame for the destruction was ... British Petroleum (BP). That's important to know, because the way BP caused devastation in Alaska is exactly the way BP is now sliming the entire Gulf Coast. Attached below is a long but very important and well argued speech by Professor John Mearsheimer. He gave this speech to the Palestinian Center in Washington DC on 29 April. Mearsheimer outlines why the 2-state solution in the Middle East is rapidly becoming a dead issue, if it is not already dead. He omits two important issues, in my opinion. They are not show stoppers to his analysis, but I think their inclusion would strengthen his case. You can take them or leave, but read Mearsheimer's article. Mearsheimer's first omission is quite important. He makes no mention of the central issue of water. Today, 30% or more of Israel's water comes from the aquifers under the Occupied Territories in the West Bank. Israel now consumes 80% of the annual replenishment volume in these aquifers, leaving the remaining 20% for the Palestinians. The result is an obscene disparity in per capita water consumption, where access to water in a desert is an essential human right to life. Fair access to water is central to establishing a viable independent Palestinian state on the West Bank (and in Gaza). Such a state would be a economically viable only if the Palestinian state had its border on the Lower Jordan river and was therefore open to Jordan. But this is an area Israel insists on controlling in perpetuity, which in effect, surrounds the West Bank. While Israel claims its occupation of the lower Jorden valley is necessary for defensive reasons, Jordan is no threat to Israel. On the other hand, Israel's occupation of the Jordan valley is intimately related to the water question. Palestinian control of the west bank of the Lower Jordan River would make the Palestinian state a downstream riparian of the water flowing into the Lower Jordan River from the Sea of Galilee (which Israel calls Lake Kinneret). The Palestinian state would have a claim on this water as a downstream riparian, and this claim that would would be made even more powerful by the fact that Israel makes an equivalent claim on the underground water flows out of the West Bank aquifer. To make matters worse, Israel now transfers water out the Sea of Galilee, via the National Water Carrier, to the Negev Desert, which lies outside of the River Jordan's watershed. Such a transfer violates international laws governing how water should be shared among joint riparians, which stipulate that scarce water resources should remain within the natural drainage areas. Combined with the acquifer under the West Bank, such a Palestinian claim would, in effect, internationalize 60% to 70% of Israel's annual water budget. In short, Israel cannot sign up to a two-state solution without huge sacrifices that would drastically change its life style. This is something the Israelis will not do voluntarily -- the Palestinians know this. (My 2002 analysis of the water question can be down loaded here.) That is why the issue of water is central to the question of a two-state solution or a bi-national state (regardless of whether it an apartheid or post-apartheid state). The second issue Mearshiemer did not address is more subtle and is less important, but it might evolve into a significant shaper of how the United States comes to view Israel as its reprehensible apartheid policies become more apparent. Like the water issue consideration of this issue would work to strengthen Mearsheimer's argument. It relates to Israel's dubious claim of being a cultural outpost of western civilization, with western democratic values, as well as its claim to be a defender and ally of the West in what Israel says is a clash of civilizations. These claims are likely to come under increasing criticism as being more in the nature of self-serving propaganda, because, although many of the original Zionists in the late 19th Century were western Europeans, the majority of Israelis (including almost all of its leaders from Ben Gurion forward) have been either Eastern Europeans or of Eastern European descent, with cultural roots in Eastern Poland, the Baltic states, the Ukraine, Belarus, or Russia, not to mention a substantial portion of the population that has roots in N. Africa or the old Ottoman Empire. These parts of the world have distinguished cultural histories, but it is preposterous to say their cultural traditions and predilection for democracy evolved like the Anglo-Saxon democratic traditions, which grew out of the acceptance of the peculiar divisions of power in Western European feudalism (beginning with the loss absolute power of Kings), particularly in England. There was little or no parallel cultural development of shared power and constraints on absolute power in the distinguished cultures of Eastern Europe, particularly within the regions governed by the Russian Empire, where the term 'feudalism' implies entirely different political arrangements. There are two other reasons why there is not going to be a two-state solution. The Palestinians are badly divided among themselves and not in a good position to make a deal with Israel and then stick to it. That problem is fixable with time and help from Israel and the United States. But time has run out and neither Jerusalem nor Washington is likely to provide a helping hand. Then there are the Christian Zionists, who are a powerful political force in the United States, especially on Capitol Hill. They are adamantly opposed to a two-state solution because they want Israel to control every square millimeter of Palestine, a situation they believe heralds the “Second Coming” of Christ. There are a number of reasons why there is not likely to be much support for Israel inside the American Jewish community as it looks more and more like white-ruled South Africa. For starters, apartheid is a despicable political system and it is fundamentally at odds with basic American values as well as core Jewish values. This is why the new Afrikaners will defend Israel on the grounds that it is not an apartheid state, and that security concerns explain why Israel has to discriminate against and oppress the Palestinians. But again, we are rapidly reaching the point where it will be hard to miss the fact that Greater Israel is becoming a full-fledged apartheid state and that those who claim otherwise are either delusional or disingenuous. Simply put, not many American Jews are likely to be fooled by the new Afrikaners’ arguments.